You are here: Home » Food » Is Matcha Better Than Green Tea? Author note: This is a guest post from Vineetha Reddy. 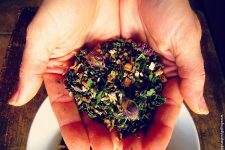 More people are starting to opt for organic tea. It is mainly due to the various health benefits that naturally grown tea offers. The current favorite of herbal tea enthusiasts all over the world is matcha. It is a finely ground variety of green tea powder. Matcha was called the ‘health elixir’ by Buddhist monks. It has the potential to increase metabolism and enhance mental health. Matcha was an integral part of traditional Chinese or Japanese tea ceremonies, and later on, it came to be recognized for its immense health benefits. Matcha is considered to be the healthiest variety of green tea. It is prepared from high-grade shade-grown leaves. Matcha is harvested by hand to ensure the proper selection of leaves and to attain the finest quality of tea. Its unique flavor has remarkable therapeutic qualities. It is a good source of antioxidant-rich components and essential vitamins, such as vitamin A, vitamin C, vitamin E, and other minerals. All these factors help in enhancing the overall health. So, how does matcha contribute to a healthier body? Read on to know more. This antioxidant-rich tea helps in building a stronger immune system. Compared to other green teas, matcha has more antioxidants and other health components. It is rich in EGCG (epigallocatechin gallate), that neutralizes the free radicals and prevents diseases and inflammation. Matcha consists of detoxifying elements that enhance the cleansing process of the body. The chlorophyll present in matcha tea is an excellent detoxifier that not only flushes out the toxins present in the blood but also helps maintain the alkalinity of blood and tissues. You would be delighted to learn that matcha promotes mental alertness and has a soothing effect on the mind. It exerts a calming feeling on the brain and prevents drowsiness. It is said that the calming effect on the brain has helped Buddhist monks maintain deep concentration during their meditation sessions. Now, if that isn’t reason enough to drink matcha tea, I don’t know what else would be. Various studies have shown that the polyphenols present in matcha tea prevent the proliferation of cancerous cells. It has been found that matcha tea promotes the induction of apoptosis and assists in significantly reducing the risks of various types of cancer. It has chemo preventive properties that make all of this possible. The flavor of matcha depends directly on the quality of leaves used and where it was cultivated. Yes, matcha has a good reputation for its health benefits, but did you know the wonders it can work in the kitchen? Matcha is widely used as an active ingredient in a variety of food items. It is often used to add flavor to chocolates, cakes, candies, and other confectionery items. We know that people consume green tea for weight loss, but matcha works better and faster. It is nearly calorie-free and is a great addition to your weight loss program. According to a study, matcha can help burn calories by boosting the body’s natural metabolism. It is the perfect option for those looking to burn some fat as it does not put any stress on the body. At first glance, matcha and standard green tea might not look any different, other than their color and consistency. Matcha has a vibrant emerald green shade while standard green tea or sencha is greenish-brown. They are also processed and prepared differently. This is why matcha retains most of its nutrients as compared to sencha. Most people have embraced green tea for a healthier life as this beverage is rich in nutrients. However, with the growing popularity of matcha, and the fact that it offers more benefits compared to green tea, people are beginning to switch to matcha. How Is Matcha Better Than Regular Green Tea? Although matcha is a variety of green tea, it is considered more nutritious and healthier than other varieties of green tea. This is mainly because while brewing green tea, most of its antioxidants and minerals remain unused as a majority of them remain in the leaves. This is, however, not the case when it comes to matcha. It is stone ground and a powerhouse of vitamins, minerals, antioxidants, and amino acids that no other green tea can match up to. It is often said that a single cup of matcha can equal the health benefits of 10 cups of brewed green tea. So, in a way, matcha is just a better version of green tea, and the benefits it offers is much more. With matcha, you get the full dose of antioxidants present in the leaves. So, take your green tea to the next level with matcha and enjoy the goodness. Vineetha Reddy is a regular practitioner and adviser of everything related to nutrition, fitness, health and wellness, and she strongly believes that the ingredients you find in your pantry provide the most benefits for good health. Follow her on Twitter for more great tips and health solutions. How does Matcha compare to Yerba Mate from Argentina it is proclaimed to have many of the same properties. I would love a recommendation for some good brands of matcha, please. Matcha does have an amazing reputation, that’s true. And, I love the benefits it offers for health. The one thing that frustrates me is the health halo. There are so many matcha drinks out there now but they’re often fairly unhealthy drinks with matcha added. Even with healthier ones, people often assume that the drink is basically a health tonic and can easily overconsume it.